If you are serious about avoiding excessive EMF, you will want to be able to measure it, or at least detect it. An EMF meter can be a great help in establishing just where the EMF hotspots are, in your home and workplace. Ionizing radiation EMF – x-rays and gamma rays. The meters on this page are not designed to measure ionizing radiation (x-rays and gamma rays), or radio-frequency / microwave radiation, unless specifically stated. Most EMF meters are single axis: they measure electromagnetic waves coming only from the direction in which you point the meter. This is perfect if you just want to measure the magnetic field strength from one EMF source at a time, and don’t mind taking the trouble to point the meter where it gives the strongest reading. For practical purposes of identifying hotspots, and for finding how far away you need to keep from an EMF source to avoid radiation, a single axis meter is quite satisfactory. If you want more precise measurements, or if you want to be able to easily assess the total EMFs from various sources at one time, a 3-axis meter is easier to use. EMF meters are either digital or analogue. Analogue meters (which have a moving needle or pointer) are easy to work with, being very intuitive and responsive as you move about with the meter. A digital instrument gives you the numbers quicker, but exact numbers are not normally that important. Neither is inherently more accurate than the other. Some people prefer digital because it looks more modern. The analogue meters do look a little old-fashioned. If you need to measure very high-strength EMFs, then choose a meter which is capable of reading to 100 milligauss or more. But most of your work with the meter will probably be to find safe places with low magnetic fields (below 2 or 3 milligauss). The frequency normally found in homes and workplaces is the mains electrical frequency of 60 Hz (or 50 Hz in some countries) so it is important that the frequency range of your meter should include this frequency. A good EMF meter will specify the frequency range it is designed to measure, for example 30 to 300 Hz. Don’t buy an EMF meter that measures DC EMF. That is a different instrument, used for measuring the strength of magnets. Don’t buy a “natural” EMF meter which measures the strength of the earth’s magnetic field in different places. The important thing is that is should measure magnetic radiation, so the units of measure should be in milliGauss or microTesla (or both). And the frequency range of the instrument must include the mains electric frequency of 50/60 Hertz, which is a very low frequency in electromagnetic terms. Some meters are marketed as being suitable for ghost hunting. This does not tell you much about the meter’s capabilities, but I prefer meters that have been designed with more down-to-earth requirements in mind. But you can hunt ghosts if you like! When it becomes known that you have an EMF meter, you will be surprised how many of your friends want you to measure around their desk at the office, or areas in their homes. Even the ones who say they don’t believe that EMF does any harm! Amazon Price: $105.06 (as of April 20, 2019 6:28 am - Details) Product prices and availability are accurate as of the date/time indicated and are subject to change. Any price and availability information displayed on the Amazon site at the time of purchase will apply to the purchase of this product. While the evidence of the carcinogenic effect of such electromagnetic emissions is still inconclusive, prudent avoidance is recommended to avoid excess exposure over long periods of time. Reads milli-Gauss and micro-Tesla on a large 1¼" high display. The EMF Meter's display indicates when the object being measured is out of range as well as when the battery is low. Features both standard and maximum hold. Powered by a standard 9V battery lasting approximately 100 hours. The Sper Scientific Electro Magnetic Field Meter comes with battery, instructions, and a soft carrying case. Display is green but not backlit. Certificate of compliance available. Uncluttered design is pleasing to the eye and hand. Single axis meter. Frequency range is 30 - 300 Hertz. Measures from 0.1 up to 2000 milliGauss. (I hope you never have to use the top end of this range!) Hold and Max (hold) buttons are both useful. Amazon Price: $129.99 $117.34 You save: $12.65 (10%) (as of April 20, 2019 6:28 am - Details) Product prices and availability are accurate as of the date/time indicated and are subject to change. Any price and availability information displayed on the Amazon site at the time of purchase will apply to the purchase of this product. The 480823 EMF/ELF meter allows you to measure electromagnetic field radiation levels from fans, electrical appliances, wiring, power lines, and paranormal activity. This EMF/ELF meter measures and displays EMF in Gauss and Tesla units with a frequency bandwidth of 30 to 300Hz. This EMF/ELF meter has a large 1/2-inch LCD display, single axis 30 to 300Hz bandwidth, and a sampling time of 2.5 times per second to provide responsive and accurate readings. Accurate readings to 4% over a measuring range of 0.1 to 199.9mG (milligauss) or 0.01 to 19.99μTesla (microTesla). 9V battery, built-in tilt stand, and user manual. Seems like a good meter, but specifications and looks of this meter and the next (Lutron 822) are so similar - I wonder if these are rebranded versions of the same meter? Check prices before you buy either. Amazon Price: $79.99 (as of April 20, 2019 6:28 am - Details) Product prices and availability are accurate as of the date/time indicated and are subject to change. Any price and availability information displayed on the Amazon site at the time of purchase will apply to the purchase of this product. Couldn't be easier to use, just turn it on and get accurate reliable readings. Perfect for situations needing high resolution measurements of AC magnetic fields without spending a lot of money. Large LCD display reads 0.1 -199.9 mG over the ELF range of 30 - 400 Hz. Provides readout in both mG and microTesla. Calibrated to within 4% ±3 digits at 50/60 Hz. This single axis meter samples every 0.4 seconds when flipped on with slide switch. Requires one 9V battery. One year limited warrantee. 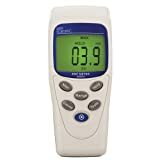 Please note: this product is intended to measure low-frequency electromagnetic fields, and does not detect radio-frequency or nuclear radiation. Amazon Price: $34.95 (as of April 20, 2019 6:28 am - Details) Product prices and availability are accurate as of the date/time indicated and are subject to change. Any price and availability information displayed on the Amazon site at the time of purchase will apply to the purchase of this product. Although it lacks some of the features of the more expensive meters, and only reads up to 10 milligauss, it is still very useful. If you are concerned about low-frquency EMF, here is a tool you can use to find out about them, at a very reasonable price. This is a single axis machine, so you will need to point the meter at the EMF source. The audio feature is a nice extra, and can be helpful in demonstrating EMF strength to other people.